Wellness tourism in India is a sector that finds a high reputation for travellers from across the globe. India offers mental, spiritual and physical wellness to the countless visitors that come to the country in search for the same. 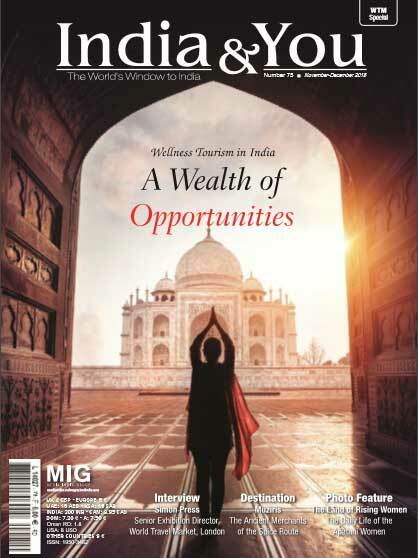 Speaking to notable people from the industry in this edition of India and You, we reveal the status of wellness tourism as well as the challenges that lie ahead for India. We move on to take a look at the various aspects of wellness in India, from Yoga to Ayurveda as well as ashrams and the unexplored places that offer solace for the troubled minds. Pristine and untouched destinations in the north eastern part of the country are brought to your attention, where unique cultures and practices still prevail. Noting the importance of the growing sector of LGBT tourism, we have a look at the sector in the country and also give a closer look to the new initiatives that are being taken to accommodate differently abled persons into mainstream professions. We offer a glimpse into the traditional practices of the red and white infused Bengali wedding which has evolved with time. We also share knowledge on the changing expression of a mysterious and deeply intriguing tribe and reveal a fashion designer’s pledge of sustaining and promoting his cultural heritage in the world. This edition of India and You thus comes as a humble tribute to the various hues and shades of the vivid heritage of spirituality and wellness that India holds. India has always been known as the home of spirituality and mysticism to visitors from all over, especially the foreigners, and sustaining this image are the humble ashrams. India is the premier partner country at WTM 2016 London tourism fair. It is experiencing a boom in domestic and foreign tourism, and will present ‘India, the Land of Eternal Heritage’, as part of a world strategy to position itself as a premium destination in all the growing segments, from religious to wellness tourism and Yoga.